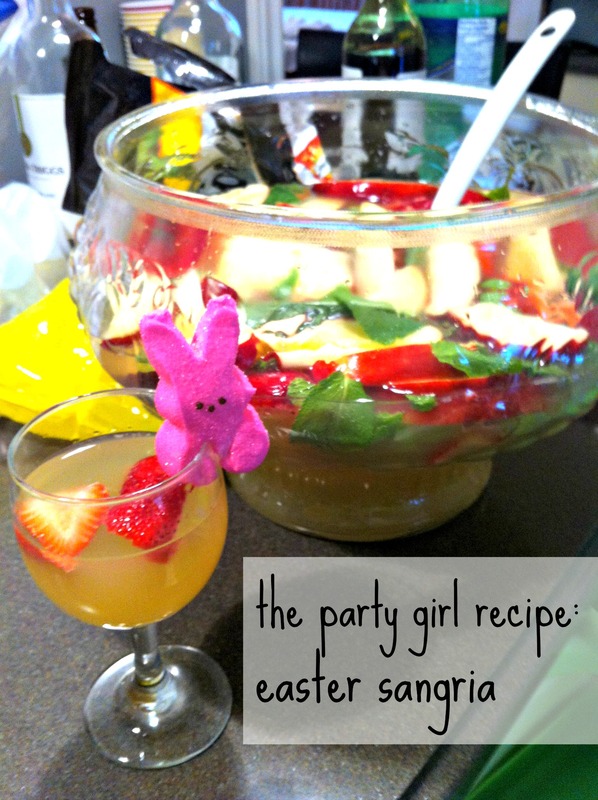 So obviously this is a little late for Easter, but this recipe turned out too good not to share, and there isn’t really anything too “Easter-y” about it that makes it inappropriate for the rest of the year, so all of that to say here is a super delicious recipe for sangria perfect for springtime! I found this recipe sort of not really at all while looking for a way to cheat my way into this year’s potluck without having to try and make something half the people would hate. I say “not really” because I ended up changing pretty much everything about it so it isn’t even worth digging it up and giving you the original. Better to start fresh with what I know works, right? SO. Another round of white wine sangria here we go! Dump the fruit in first and pour the wine over top of the fruit. Add the simple syrup. I think the first time I added the San Pellegrino and Sprite and then let it chill, but the second time I waited until it was chill and then added those and it made it easier to judge those ingredients which is good I think. Don’t stress if you forget and add it all at the same time (definitely what happened the first time) because it didn’t taste that much different, I just felt safer having more control because I’m crazy. So there you have it! I’ve made it twice now and it was super good both times. It’s really light a fresh so it’s perfect for spring, but it’s also really versatile with all those different fruits and flavours, and it really works for any occasion. Get excited Party Girls, your weekend just got a lot more interesting!